What a strange winter we are having this year! Warm and wet, then colder and dry. Mother Nature can’t seem to make up her mind. Personally, I’ve been waiting all winter for a nice snow storm. Even while we were in Vermont over Christmas and New Year’s, there were just a few snow showers – although happily, we did wake up to a dusting of snow on Christmas morning! It’s frustrating to me that, whenever precipitation is in the forecast, the temperatures are usually on the rise. I’m sure many other people are overjoyed about this though! The warm winter weather has had a noticeable effect in the garden. My Christmas rose (Helleborus niger) lived up to its name this year. 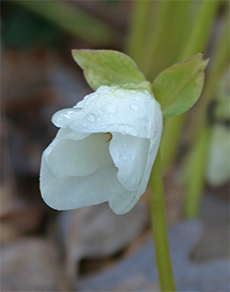 It was beginning to bloom in my garden by December 20th – the earliest I ever remember it coming into bloom. Last year they didn’t begin to bloom until early February! 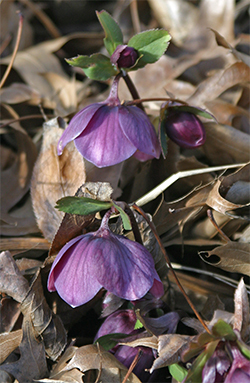 The warmer winter has no doubt contributed to the early appearance of these attractive flowers. Now it’s in full bloom – so beautiful. One of my other hellebores, Helleborus foetidus, has been blooming since early December and it is still going strong. What a wonderful addition to the winter garden. Helleborus foetidus has been blooming since early December. 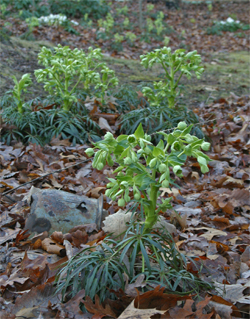 Clumps of Helleborus niger are visible in the distance. Helleborus foetidus reliably blooms by at least January in my gardens. The beautiful evergreen foliage and interesting chartreuse blooms are very eye-catching against the brown backdrop of the fallen oak leaves. I found another surprise today when I went out to take some pictures of my hellebores – a single budding snowdrop (Galanthus)! I love these early blooming bulbs. We had several clusters planted right beside our front sidewalk in New Jersey when I was growing up. They often poked up through the snow in February bringing the promise of spring. We just planted some for my mom in Vermont when we visited over Thanksgiving. Here’s hoping she’ll have some cheery snowdrop blooms to enjoy this spring! 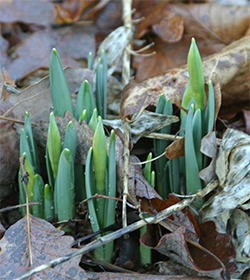 It's distressing to see the daffodil flower buds up already! On a walk through Andre’s gardens this afternoon, I noticed that many of his hellebores are blooming, too. Beautiful Helleborus orientalis flowers have popped up through a layer of oak leaves. I also noticed that quite a few of his daffodils have popped up but I didn’t see any flower stems, just foliage. These gardens are more exposed than our front bed and I’m sure that has something to do with it, although it may also be a varietal difference. Hopefully when I check my gardens that are less protected, I’ll find that just the leaves have come up and no flower stems. The foliage can generally take the cold especially if it is covered with some pine boughs. Will we have an early spring? Maybe – time will tell – but up and down the east coast, we’re still waiting for winter to happen! I won’t hold my breath though; the long range forecast for our area doesn’t look much different than what we’ve been experiencing so far – highs in the 50’s almost everyday through the first week in February! Bummer – I’m ready for snow! Heirloom Vegetables – Oldies but Goodies! It’s January and that means it’s garden planning time. At our house January means vegetable garden planning time because this is when all our vegetable seed catalogs begin to arrive in the mail. Saturday mornings in January are often spent browsing through these over a steaming cup of coffee or two. 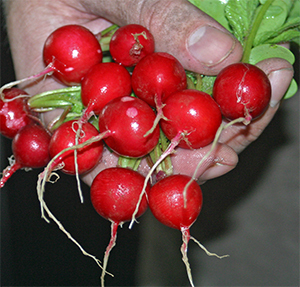 Cherry Belle is a wonderful radish that I never realized was an heirloom. There are heirloom varieties of almost every type of vegetable. We’ve actually been growing some of them for years – I just never knew it because they weren’t listed in the catalogs as such. What exactly is an heirloom plant? The answer isn’t truly clear cut. I have seen heirlooms defined as varieties that are more than 50 years old, more than 100 years old, varieties grown before World War II, but in the simplest terms, these are open pollinated varieties where the seeds have been passed down for many generations. These are the vegetable seeds that our ancestors planted back in the days before commercial chemical fertilizers and pesticides were commonly available. The seeds from the most successful, most flavorful plants were carefully saved and replanted from season to season and passed on from generation to generation. Regardless of their age, heirlooms are plants that are open-pollinated, meaning they are pollinated naturally and grow true from seed year after year. This is in contrast to hybrid varieties which are the result of the intentional cross pollination between two related but distinctly different varieties. Seeds from hybrids are often sterile or, if they do grow, they produce plants that don’t have the same characteristics as the parent plant. This is great for the seed companies because it forces the gardener to purchase new seeds each season – the seeds can’t be saved and replanted from year to year. 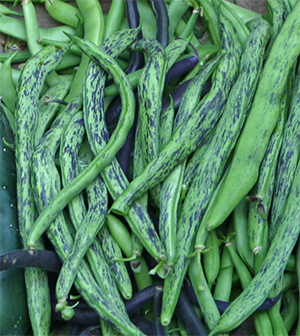 Rattlesnake beans are a delicious heirloom pole bean - my favorite. Why grow heirlooms? Some people swear that the flavor of heirloom vegetables is far superior to that of the hybrid forms. In my (so far) limited experience with growing heirloom tomatoes and beans, I have found this to be quite true – which is why we have vowed to try more this year. The modern hybrids were created to promote certain traits; disease resistance, uniformity of shape and size (often for ease of shipment), uniformity of color (for marketability), ability to keep for a long time without spoiling, and a larger per plant yield. Unfortunately, it seems that for some of these F1 hybrids, flavor and texture may have been lower on the list of desirable characteristics. Go figure! 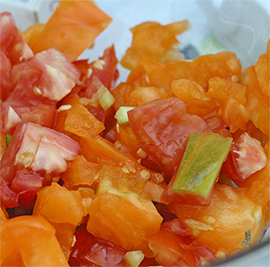 A colorful salsa made from various heirloom tomatoes - beautiful AND tasty! While they may not have a perfect shape with uniform color and smooth skin like many of the hybrid varieties and though they may be more prone to some diseases, heirloom vegetables are definitely worth growing for their outstanding flavor and unique characteristics. Here are some interesting heirlooms we want to try this year: ‘Ronde de Nice’ (a small, round zucchini), ‘Delicata’ (a cream colored winter squash with dark green stripes and sweet orange flesh), ‘Tennessee Sweet Potato’ (a large, pear-shaped winter squash), ‘Pruden’s Purple’ tomato, ‘Kellogg’s Breakfast’ tomato (an orange colored tomato that just sounds cool! ), and ‘Black Krim’ tomato. We’re still looking but hope to make our final decisions this weekend and place our orders! I’m looking forward to a great gardening season! Check our website for a list of our recommended seed catalogs including many that carry heirloom seeds! Moss – Why is it in my yard? Moss is taking over the yard and choking out the grass. 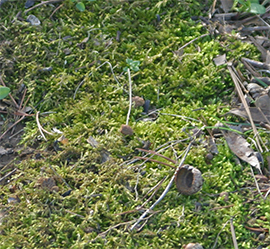 Moss creeps into the lawn when grass is thin and weak due to unfavorable growing conditions. Hmmm, this sounds familiar! Much of my lawn is more moss covered than grass covered. The thing is that moss doesn’t really choke out the grass but rather it slowly creeps in and thrives under conditions that are unfavorable for the growth of most turfgrasses. Chances are that the areas where the moss is growing did not have a healthy, vigorous stand of grass to begin with. I know that’s how it is at my house. 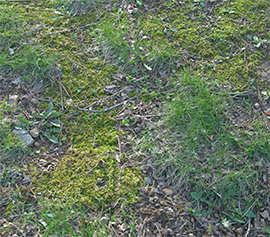 Generally moss cannot compete with grass but it can become established in the lawn when the grass is weak and thin due to poor growing conditions. How can you get rid of moss in the lawn? There are several products that can be sprayed or spread on the lawn to kill moss but, unless you figure out and fix the environmental conditions that allowed it to become established in the first place, you will be throwing your money away because chances are good that it will just come back. So what are the conditions that favor the growth of moss? The trick to eliminating moss growth in the lawn is to improve the growing conditions for the grass, at which point the grass will easily outcompete the moss. Improve the soil. The first thing to do is get your soil tested. 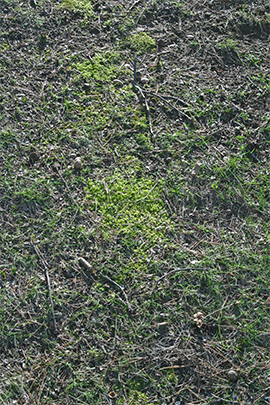 Unlike turfgrass, mosses grow well in areas of low pH (acid soils) and low soil fertility. A soil test will provide you with information on nutrient availability and the soil pH. The analysis from these tests will often include recommendations for amendments to improve the pH and nutrient content so the soil is perfect for the optimal growth of turfgrasses (and the demise of the mosses). Moss absorbs water and nutrients through its leaves so it is able to establish in areas with poor soil fertility. Aerate your lawn. When the soil is compacted, grass doesn’t grow well because nutrients, air, and water cannot penetrate the soil and get to the roots. This doesn’t affect the growth of mosses because they are non-vascular plants that absorb water and nutrients through their leaves; the “roots” function solely to anchor them to the soil. Core aeration reduces soil compaction and encourages the development of a deep healthy root system for the grass. This should always be done when the grass is actively growing so the roots have time to recover. A core aerating machine can be rented for the job. Improve drainage. Wet soggy soils lack adequate oxygen for the growth of healthy turfgrass. Improper watering practices and/or poor drainage can lead to overly wet soil. When you water your lawn, be sure to water slowly and deeply every 10 days or so unless there is a soaking rain. This will allow the water to seep deeply into the ground and will encourage the formation of a deep root system. Be especially careful not to over water grass that is growing in shade. It doesn’t use as much water and over watering can lead to disease problems. Core aeration will help improve drainage but sometimes other measures must be taken including the installation of drainage tiles or filling in depressions. This shady section of my lawn has more moss than grass! Even a shade tolerant grass selection didn't perform well. Reduce shade on the lawn. Probably the main reason that moss invades our lawns is that the yard is too shady. Most varieties of turfgrass do not grow well in these conditions and when the grass is thin and weak due to inadequate sunlight, that’s when the mosses take hold – they love shade! I know this is why we have so much moss in our yard. The parts of our lawn that are covered with moss are in fairly deep shade. This is probably one of the hardest conditions to correct. Often the selective removal of a few trees is all that is needed to reduce the amount of shade on the lawn. In my case, since we are surrounded by woods, this would not be practical. Sometimes simply removing some of the lower branches of the trees is enough to increase the sunlight that reaches the grass. Another approach is to thin the tree canopy (but never remove more that 20%-25% of the limbs in any one season). It is usually wise to consult a certified arborist before doing any major tree work. Of course the other alternative is to renovate and reseed the shady areas of the lawn with a shade tolerant grass seed blend. This works well if the area is not in deep shade. If your problem is deep shade and you can’t increase the sunlight, you’d better just give up on grass and plant a nice shade tolerant ground cover like vinca or pachysandra! Once you’ve figured out why your grass isn’t growing well, you can correct the problem and THEN you can take steps to kill or remove the moss. After the moss is gone, you can reseed the area with the confidence that your grass will come in strongly and the moss will be history! Read more about moss growth in lawns. Until next time – Happy Gardening and Happy New Year!